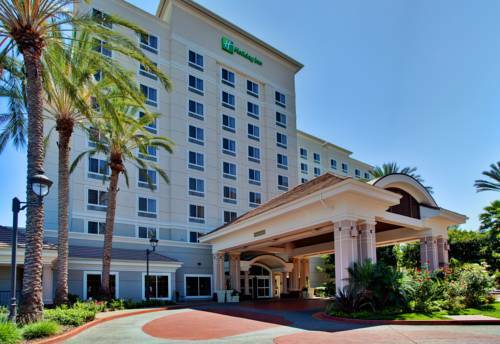 Anaheim Hotel convenient to the Disneyland Resort Enjoy your stay at Orange Countys Holiday Inn Anaheim Resort located in southern California. Your guest experience includes nearby local shops, restaurants and entertainment highlights! Were just minutes away from the Downtown Disney District and the Anaheim Convention Center. Try our Burger Theory Restaurant and Bar when dining at the hotel or take a soothing dip in our outdoor pool. In Anaheim, guests find our hotel a genuine value. A contemporary Burger restaurant that also offers pizza's, salads and many other choices that go great with the large selection of Craft Beers available from the Full Service bar. Located just off the dining room in the Burger Theory Restaurant, is a comfortable bar/lounge, offering a large selection of Craft Beers and cocktails as well as the full Burger Theory menu. Also, enjoy 16 TV screens, and free Wi-Fi internet service. 1400 Square Feet of flexible meeting space. The room can break into 3 separate meeting rooms each 440-528 Square Feet. The Pacifica features high 12' ceilings and state-of-the-art sound proof walls, having been built in 2001. Very comfortable setting. Pacifica I is the perfect room to accomodate a small meeting, reception or meal function. Pacifica III is the perfect meeting room for small meetings and banquet functions. Children's program - Outdoor heated pool and whirlpool. Disneyland, less than one mile away. Knott's Berry Farm, 5 miles. AMTRAK Train Station in Anaheim. 16 hole professional level golf course. Come visit Disneyland located under one mile from the hotel. Shuttle service offered during the hours of operation of Disneyland. Shuttle price includes unlimited day use. Anaheim Convention Center is located under one mile from the hotel. There is a shuttle that runs everyday, and the first stop from the hotel is the convention center. The Honda Center (home of the Mighty Ducks Hockey Team) is located 1 mile from the hotel. We are the best location for visitors wanting to attend events at these facilities. Angel Stadium, home of the Los Angeles Angeles of Anaheim. Over 50 stores of all kinds, along with 15 restaurants to choose from. Also for entertainment there is Dave & Busters, 30 movie theatres and Lucky Strike bowling lanes. Pirate's Dinner Aventure is the world's largest and most interactive dinner show. Large shopping mall with over 180 stores. You can find JC Pennys, Macy's, Nordstrom, along with several other specialties shops. This mall also offers a food court, restaurants and movie theatres. Vist just one of the many beautiful beaches in Orange County. Newport Beach not only offers white sand beaches, but also Fashion Island shopping area, Balboa Island/Fun Zone, and many stars homes. Come visit one of our beautiful Orange County beaches. Home on world famous surfing contests. Universal Studios Tours is the largest Film and Television studios in the world. Where the greatest mements from movies and television come to life, like the new Simpson Ride and Revenge of the Mummy. An international animal experience that includes giant pandas, koalas, and Komodo dragons. More than 4,000 animals representing 800 species live at the zoo, which is also a renowned botanical garden.